Costosternal chest pain asks is this an MI or something biomechanical? Costosternal chest pain research declares that Tietze's syndrome is the cause of roughly one third of people presenting at the emergency room with a suspected heart attack; breastbone pain. 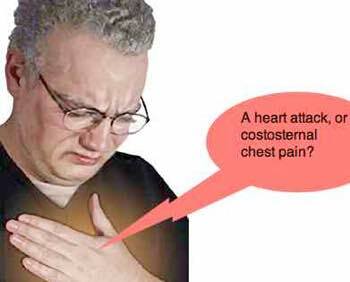 Costosternal chest pain - in the joint between the rib and the breastbone - is the most common cause of "non-heart" chest pain. Chiropractic treatment of this breastbone pain is built around a thorough understanding of the anatomy. This page was last updated by Dr Barrie Lewis on 6 February, 2019. This morning I fell down the stairs. It happened so suddenly that I don't remember any of it; but as soon as I realized what was happening I felt a sharp pain by the breastbone. All day everything I've done has hurt. It is painful to breathe, I have a really hard time buttoning up my pants, and bending over to pick anything up is rather difficult. 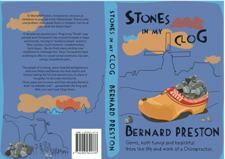 But as far as I know when I fell the only things that touched the ground were my arms, back, legs, and buttocks. One of two things has probably happened; you've either cracked a rib which is quite likely since taking in a deep breath is painful, or injured the costosternal joint. The cracked rib, assuming it's an undisplaced fracture, will heal in about a month, with no treatment. Grin and bear it. Use ice, and don't do the things that cause pain. Don't breathe. It's likely to be quite painful for a couple weeks. An injured costosternal joint is more difficult, and also often has a corresponding pain in the midback. It can lead to a distressing condition called Tietze's syndrome. You need to use your common sense. If your gut feeling is that you've had a serious injury then it's probably best to get an X-ray. If not, use alternating ice and heat and be careful for a couple days and see what happens. If the pain continues, don't leave it. Tietze's syndrome can be murder. The costo-chondral cartilage (see pic below) is the cause of one third of patients complaining of chest pain in one hospital's heart clinic - it's THE MOST COMMON CAUSE of non-heart chest pain. Costosternal chest pain research declares that Tietze's syndrome is the cause of roughly one third of people presenting at the emergency room with a suspected heart attack. One of the simplest treatments is cold hot therapy. In the emergency department, approximately 10 to 15 percent of adults and 23% of children presenting with chest pain have a musculoskeletal breastbone condition, like Costosternal Chest Pain. In one large study 11 percent of adults presenting with chest pain were felt to have a costo sternal cause. The incidence rose to 26 percent in those patients considered at low suspicion for myocardial infarction, making this THE MOST COMMON category of non-cardiac chest pain in this setting. In a study of 250 patients hospitalized for chest pain, 23% of the non-cardiac patients were felt to have a Costo-sternal (musculoskeletal) cause. In a review of 399 episodes of chest pain evaluated in primary care practice settings, 36 percent were categorized as costo sternal (musculoskeletal) in origin, making this the most common diagnostic category. Could it be a HEART ATTACK ...? Chiropractic help receives many queries about breastbone discomfort, also known as costosternal chest pain. Mr Slechtriem is a barge captain ferrying goods along the Rhine to Switzerland from Rotterdam. He consulted me for headaches that plagued him since a childhood fall from a swing. On further questioning about conditions, he spoke of the frequent debilitating pain in the chest - pointing directly over the costo-sternal joints. He was clearly a non-heart patient. Young, strong, non-smoker with low blood pressure. In any case he had been medically assessed. Whilst the condition has not completely abated, he reported that within a month of starting treatment that the pain was at least 80% better. It does rear its ugly head occasionally, but abates now of it's own accord. He comes for management of his chest pain and headaches about once in 6 weeks, which keeps it under control. We are not going to cure him, alas, but he is well pleased. In an average primary care clinic, at least one third of patients complaining of chest pain, have this costo-sternal pain syndrome. It may progress to Tietze's syndrome. For more information on heart-related CHEST PAIN. 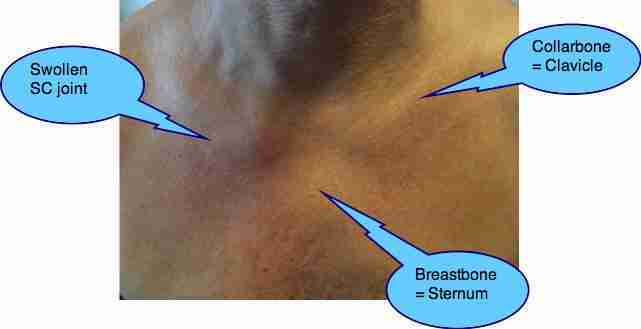 Tietze's syndrome is characterised by tenderness and sometimes swelling of the breastbone rib joint, and sometimes that between the clavicle and the sternum. In anatomical terms it's called costosternal chest pain. I call it a stage 4 of costosternal chest pain; it can be a very distressing condition that has no acknowledged and scientifically proven treatment, but it responds reasonably well to chiropractic. Note well that a heavy manipulation in the mid back will aggravate Tietze's syndrome, and in fact the lower grades of costosternal chest pain. 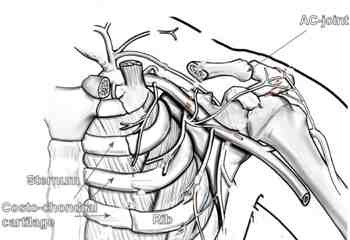 The chiropractic adjustment of choice is the anterior thoracic technique. It occurs not uncommonly after breast surgery and mastectomy causing great distress in the patient who assumes there has been a metastasis to the ribs or lungs. A thorough, careful examination of the whole area is vital to make a speedy diagnosis, because Tietze's syndrome is very treatable with chiropractic, but you're unlikely to have a cure. As an aside we shouldn't be too disturbed that our conditions can't be completely cured; it's just as true of most medical problems. It's a good reason not to allow conditions to become chronic; for example, research indicates that no matter what treatment you have, after six months of neck pain you have it for life. That's most likely also true of all our aches and pains. See your local chiropractor for your costosternal chest pain, and make sure that you do it as soon as you realise it's not going to resolve on its own. Certainly don't wait six months, or you may have it for ever. Our best solution then is an occasional, but regular chiropractic adjustment for your chronic conditions; rather like the diabetic must continue with medical care. Having said that, with type 2 diabetes the most important treatment is done at home; strictly limiting refined carbohydrate and taking regular short walks after meals to stop spikes in blood glucose. Likewise using ice and gentle massage between the ribs is something you can and must do at home, daily if necessary. Costosternal chest pain research declares that breastbone pain is the cause of roughly one third of people presenting at the emergency room with a suspected heart attack. Google appears to frown on too many links, so phrases in bold, like that Stones in my Clog below, need to be put into the Site Search function in the navigation bar on your left if you want more information.